Besides the fact that its price is one of its strongest selling points, the Barnes & Noble NOOK Tablet has shown itself to be a very reliable Android based tablet on its own. Although its apps support is regarded as limited versus others that have full access to the Android Market, users are still able to get specific apps onto it, thanks primarily to its ability to allow the sideloading of apps. Therefore, once you’ve installed the update, v1.4.1, you can kiss goodbye the usefulness of being to install third party apps easily. Going forward, if you attempt to sideload apps, you’ll simply be thwarted with an error message stating that apps from the Barnes & Noble NOOK Store are the only ones that can be installed. However, if you’ve managed to previously sideload apps prior to installing the new firmware update, those apps will remain on the NOOK Tablet. Indeed, it’s going to break some hearts, but knowing that there is a healthy community surrounding the NOOK Tablet, we’re certain that there will eventually be a way around all of this. I originally bought the Fire and returned it for this. Now your telling me the extra $50 I spent for the gig of ram is going to be surpassed by the inability to side load apps? Barnes... very disappointing. I may get my Kindle back. I just finished reading an article about how the KF is getting an update that breaks root. Plenty of comments were," This is why the Nook is better" Who's laughing now? I was thinking the exact same thing when I saw the title to this. Haha perfect. f**k you Barnes & Nobles! Peanut-butter E-bay time!!!!! Don't upgrade wait for new rooted. by an hp and cyanogen it, or bb playbook. these kiddy tablets just dont' fly with me. 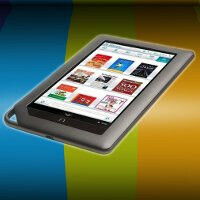 Which one is better without hacking, Kindle Fire or the new Nook Tablet? BUY AN HTC FLYER PEOPLE! This is why I bought one. It's ONLY 299 at BestBuy every day. I can't believe it doesn't get more attention. I have access to Amazon, Barnes, and of course the regular app Market and all the other goodies of Google. Because it has a GB of ram, the screen has awesome resolution that looks better and clearer than both of those. It has a rear and front facing camera, Bluetooth, GPS, etc. I installed Swype, (which flat rocks on a tablet btw). And even though it only has a 1.5Ghz processor, it runs at dual core speeds. It's much smoother, faster at everything than the other two with their dual cores. Not to mention It'll always have side-loading available as well.The Sense user interface is so much better than that of the Nook and Fire. It has a polished aluminum and white back housing, so the overall premium build quality is also much nicer. It has 16GB of built in memory, with the option to add an additional 32GB SD card. (48GB of memory- What!?) It does EVERYTHING+ that my ex-iPad did, but in a more convenient 7" size. It's a complete no brainer. But with all the advertisement going on for both nook and the K-Fire, only a few are seeing, or even hearing about the Flyer being the obvious, and clearly better choice over those two by leaps and bounds. HTC is really dropping the ball on advertising the Flyer, especially right now as people are really starting to like the 7" tablets. They need to seize the day on this one.